The Cataloochee Valley is one of the most picturesque areas in the Great Smoky Mountains National Park. It is know for abundant wildlife, especially elk, beautiful mountain scenery, and historic buildings. This isolated valley is surrounded by some of the most rugged mountains in the southeastern United States. The area was once a thriving farming community. Some of the historic structures, such as cabins, a school, churches, and a barn, have been preserved. Five of the historic buildings are located along the road. Four others are reachable by a short walk on the Little Cataloochee trail. A self-guiding tour booklet is available near the entrance with information about the area, including the historic structures. Cataloochee is similar in many ways to cades cove, but not nearly as crowded because of its location on the eastern side of the park, away from the busiest traffic routes. See map below for directions. It is not the easiest place to get to, requiring driving on winding gravel mountain roads, hence the lower crowds. Because it is so isolated, there are no stores or gas stations close by, so pack a lunch and have a full tank of gas. Catalochee is among the best places in the Smokies to view wildlife. 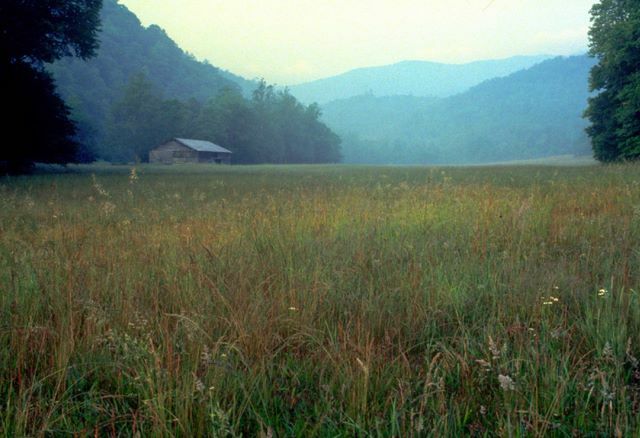 The area is best known for elk, which were reintroduced in the Cataloochee Valley in 2001 and 2002. More information about the elk can be found on the National Park web site. Deer, black bears, wild turkeys, and red wolves are also commonly seen here. Early morning and evening are the best times to see wildlife. In September the elk are very active because this is mating season. The Fall colors are beautiful in Cataloochee in mid to late October. While much of the Smokies are very busy at this time, Cataloochee is not nearly as crowded. 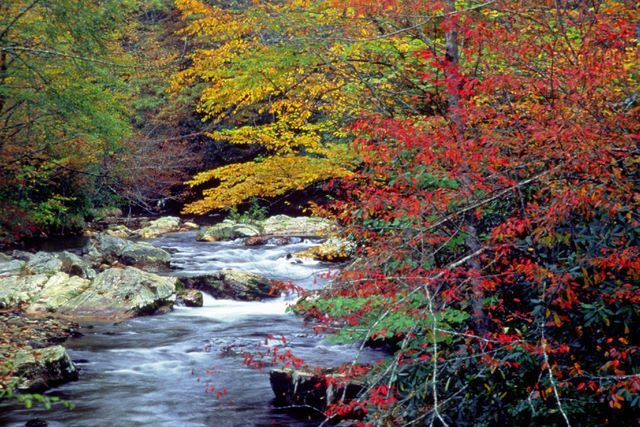 The Cataloochee Campground is located along the beautiful Cataloochee River. It has restrooms with running water and flush toilets, but no hot water, showers, or RV hookups. There are 27 campsites available which can be reserved at recreation.gov. It is open from mid-march through October. Each campsite has a picnic table, a fire grate, and a clear area for a tent. RVs up to 31 feet are welcome. Group camping is also available. Cataloochee has a horse camp and several trails that allow horses. Horse camp sites my be reserved in advance by calling (877) 444-6777 or on the web at recreation.gov. Boogerman Trail is a moderate 7.4 mile round trip hike which takes you through old growth forests, past the remains of historic home sites, and past streams and falls. Caldwell Fork Trail is a moderate 5.8 mile round trip hike which crosses several streams. Rough Fork Trail is 6.5 mile hike past several restored old farm houses. Cataloochee Divide Trail is a moderate 11.5 mile round trip hike which runs along the southeast border of the national park. There are many very nice and remote streams in the area that are great for fishing. A fishing license is required. Fishing regulations can be obtained at a park vistor center. Cataloochee is located near Maggie Valley, NC. Click below for a weather forcast for Maggie Valley. From Interstate 40, take North Carolina exit #20 to Cove Creek Road. Follow the signs 11 miles to Cataloochee Valley. The last part of the road is gravel. If coming from Gatlinburg, take hwy 321 north to Interstate 40 south and then follow directions above. From Asheville, take Interstate 240 west to Interstate 40 west to exit #20. It is about 65 miles from Gatlinburg, about 40 miles from Asheville, and about 40 miles from Cherokee. An alternate route, which is more scenic but not recommended for RVs, trailers, or people people who get car sick, is to take route 32 from Cosby, TN into Cataloochee. It is a long, winding, scenic, partially gravel road into Cataloochee. Wildflowers of the Blue Ridge and Great Smoky Mountains A beautiful wildflower guide with many full page full color pictures. The pictures and informative descriptions help you identify wildflowers in the Smokies and surrounding areas. 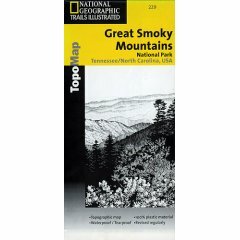 Trails Illustrated Topo Map is an excellent map of the Smokies, showing roads, hiking trails, camping areas, picnic areas, ranger stations, and more. It is waterproof and tearproof, so it is very durable to take with you camping or hiking, even if it rains. Insiders' Guide to the Great Smoky Mountains provides good information about outdoor activities in the park. It also provides complete information about the surrounding areas including dining, lodging, and area attractions.